Reminiscent at times of the 1983 Film Gorky Park , Child 44 is another thriller set in Russia. This one is set in the oppressive Stalinist era that existed after World War II. 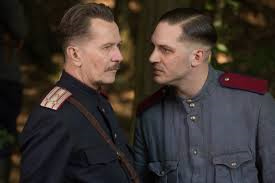 Tom Hardy stars as a man who was raised to be loyal to the militaristic and oppressive regime of Joseph Stalin. From the beginning, his loyalty is tested. First, with the notion that “there is no such thing as murder in Paradise.” This is the ironic motto under which the police and military must operate. Later, when Hardy’s character, Leo, is asked to betray his wife, he must choose where his loyalty truly lies. There are some plot points to quibble over. The James Bond method of doing away with the protagonist makes one ask, “Why not simply shoot him?” But the plot does manage to wrap the ends up at a slow but steady pace. Perhaps a slightly shorter running time (it runs 2 hours 17 minutes) might have increased the pace. Noomi Rapace, seen with Hardy in last year’s excellent film, , pairs again with him as his wife, Raisa. She is an effective foil for Leo’s determined and steadfast character who is fixated on learning the truth. Gary Oldman seems slightly under-utilized as General Nesterov, Leo’s skeptical and eventually supportive superior officer. All in all, the film features a good cast and an uneven screenplay, which makes for an interesting, but not overly exciting thriller.